The December birthstone is turquoise. This is a special stone that is said to bring good fortune to people born in the month of December. The bright green blue of turquoise is what gave the name to this distinctive color. Turquoise is found naturally in colors that range form the palest of blues and greens to deep and vibrant hues. As well as being found in a natural condition, the stone is sometimes treated to give it a richer and brighter color. Turquoise is typically cut into cabochon and bead shapes as this shows off the stone to its best advantage. Turquoise often has natural inclusions and this is part of the attractive and organic nature of the stone. There are items of December birthstone jewelry available in many styles and this makes it great for giving as a gift. 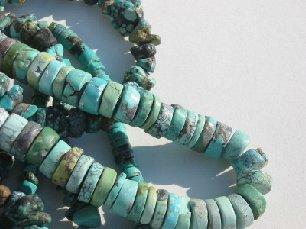 There is bound to be a type of turquoise jewelry available to meet every budget. Turquoise looks stunning when set in silver or white gold. The bright white of the metal complements and contrasts with the green blue of the stone. This means that it is often found in rings, pendants and earrings. Turquoise beads look stunning and these are popular as they look great when teamed with formal wear and fantastic with casual attire. This makes them an extremely versatile option. Tanzanite is a lovely birthstone alternative for December. December birthstone jewelry makes a lovely gift for someone whose birthday falls in the last month of the year. To make it extra special try wrapping the gift in complementary colored wrapping paper or adding a ribbon that accentuates the color. Tanzanite is often regarded as being an alternative to turquoise. This is a clear blue stone that is often faceted. The many faces cut into the surface of the gemstone catch the light and gives tanzanite a distinctive sparkle. December birthstone jewelry will always be treasured by someone whose birthday falls in this month.